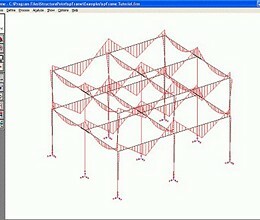 spFrame, formerly pcaFrame, is a feature-rich structural analysis program for two- and three-dimensional structures subject to static loads. Used by academic and industry professionals, it offers a quick and straightforward analysis tool. spFrame has a fast and robust yet simple graphic interface that displays the modeled structure, the input loads, the deflected shape, and the resulting moment and shear diagrams. The graphic interface allows zooming, translating, rotating, and selective viewing of the graphical image. With spFrame, you are able to view all output results in text or graphical formats before printing. Output includes: joint displacements and rotations, support reactions, member end forces and moments, segmental member results (at 100 locations per member), member summary, result envelopes, and diaphragm displacements. 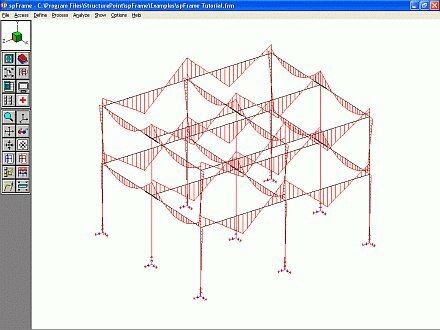 A graphical model generator (spCad) is provided with spFrame to facilitate modeling a structure by simply drawing it right on the screen. Member and joint properties, loads, and other assignments are also applied graphically through user-friendly and easy-to-use, yet powerful, interface. spCad will eliminates the drudgery of manual data entry and enables fast generation of the most complicated structural models. * spFrame download link provides trial version of the software. spFrame has been rated 3.0 out of 5 points. A total of 2 votes cast and 0 users reviewed the software.